HS is a chronic inflammatory skin disease associated with the formation of multiple abscesses, nodules, and scars in the apocrine gland-bearing areas. Sites that are affected include inguinofemoral (groin), axillary (arm pit) , perianal, gluteal (buttocks) , and submammary (breast) regions. Approximately 1-4% of the population is affected by this disorder. The apocrine (sweat) glands get occluded by hyperkeratotic (skin material) debris that produce follicles that rupture and cause inflammation. The course of HS can vary from small pustules to inflammatory nodules, and in some cases become inflammatory, deep abscesses and draining sinus tracts. In other words, an infected pock marked mess. This disease is staged in to three categories with Stage 1 being basic abscesses without scarring and Stage 3 being the worst, having destroyed completely an area with multiple abscesses that can be interconnected and have sinus tracts (holes) connected to the skin surface. For those with this disorder, wearing loose fitting clothes that don’t rub the areas involved, not pinching the lesions, wearing antiperspirants but not applying perfumes to the area are helpful. Topical anti-bacterial cleansing with Triclosan-containing soaps will decrease bacterial colonization. Don’t scrub the area when washing as that will inflame the lesions more. Primary treatment includes quitting smoking – which is highly associated with Hidradenitis Suppurativa. If you continue to smoke, don’t expect to get better. Also weight loss is important as 2/3 of those with HS are overweight. The HS may be due to elevated insulin levels, hormonal changes, and dietary problems in these individuals. Avoiding dairy and high glycemic loaded foods can decrease the disease. Metformin, an anti-diabetic drug can be helpful in decreasing the HS disease burden. This is a result of the insulin-sensitizing effect of Metformin as it is believed that HS results, in part, from elevated insulin levels. Treatment methods, after the basics listed above, include the use of Resorcinol, a chemical peeling agent, which as a 15% solution and applied twice a day, can improve the HS lesions and decrease pain and inflammation. Also used are antibiotics, usually Doxycycline and minocycline first line, then Clindamycin if those are not helpful. Clindamycin mixed with Rifampin has been effective in 2/3 of patients with moderate disease. Some physicians use a combination of Moxifloxacin, Rifampin, and Metronidazole with good success. Dapsone, an antibiotic with immunomodulatory effect, has had effect in early stage disease. Intralesional injection of steroids is another option for local treatment as a monthly injection over a period of three months or so. Occasionally surgery must be done or an incision and drainage when a large abscess forms. Androgens can promote the development of HS. It has been found that drospirenone- (or norgestimate-) containing oral contraceptives with spironolactone ( a blood pressure medication with anti-androgen effects) has been helpful in women. For patients who don’t want to quit smoking or cannot lose weight and for those who fail other medical therapies, anti-TNF (tumor necrosis factor) agents are effective and have been approved for use in HS. The injected agent Infliximab was found to have a 50% reduction in severity score with most having improvement in pain and quality of life. Adalimumab was recently FDA approved for HS treatment but has been less effective. Whereas Infliximab is administered by weekly infusions, Adlimumab is given by subcutaneous weekly injections. The problems with the anti- TNF agents include risks for infection, heart failure, demyelinating disease, a lupus-like syndrome, and malignancy. Oral retinoids such as acitretin and Isotretinoin have shown beneficial effect as well. Acitretin given as 0.6 mg/kg daily for 9 to 12 months showed highly effective in diminishing the disease, an effect that remained after the medicine was stopped, unlike with the biological agents, which have a higher relapse rate after discontinuance. Isotretinoin also has been effective in several studies with lower relapse after discontinuance. Both agents are highly teratogenic. Systemic prednisone can decrease inflammation when given over 7-10 days at 40 mg a day. Cyclosporine has also been used as well. Vitamin D3 supplementation at 300-6000 Units daily has been helpful in decreasing HS lesions in some individuals. Zinc salts have antiinflammatory and antiandrogenic properties. Zinc Gluconate at 90 mg daily was very effective (36%) in significantly decreasing the inflammation of low grade HS, with beneficial effect in most who use zinc supplements. What is interesting about Hidradenitis Suppurativa, is the inflammatory component of the disease. We know that the risk of the disease increases with obesity and cigarette smoking, which are also associated with elevated markers of inflammation themselves. Obesity is associated with elevated inflammatory markers and insulin levels, which appear to play a role in the genesis of HS as well as other diseases (i.e hypertension, fatty liver, diabetes, cancer, etc) In the article listed below, it was recognized that HS and the risk of it’s progression can be estimated by CRP levels, a marker of total body inflammation. CRP is produced by the liver in response to IL-6, another inflammatory marker. This generalized inflammation affects multiple organ systems. The above study examined the use of CRP and white blood count (wbc) in estimating the risk of progression and inflammatory content of patients with various stages of HS. The study found that CRP level and neutrophil counts are effective tools for assessing the extent of disease severity and grade of inflammation in patients with HS above and beyond the association of these inflammatory markers with coincidental comorbidities. For example, obese patient have elevations in CRP and smokers have higher white blood cell counts, but this study showed that CRP and wbc independently predicted worse disease status in patients with HS. There was a significant correlation between these inflammatory serum markers and disease severity according to HS severity grading scale. The end finding is that CRP is a significant and independent predictor for severe disease activity of Hidradenitis Suppurativa. What interests me about this disease is it’s associations with comorbidities. Smokers have little hope of remission of HS and HS is associated strongly with obesity. These same disorders are inflammatory in their own right. It is felt that the elevated levels of insulin and insulin resistance in obesity may play a role in worsening of HS. Obesity and the hormonal catastrophe associated with it is also associated with coronary heart disease, hypertension, fatty liver, and a host of other life-limiting diseases. So again, here is a disease process (HS) that is, in part, partially a creature of our own design – bad habits. If we could stop smoking and limit obesity, how much HS would really exist? The measurement of leukocyte telomere length (LTL) is a method to determine future health, and short LTL is associated with morbidity and mortality independent of age. In the study, 6405 people ages 20-84 were assessed for leisure time screen-based sedentary behavior, namely television, video games and computer use, and a LTL assay was performed on the participants to determine the length of their telomeres over a certain period of time. It was found that for every hour increase in screen based time, the individual had a 7% increased risk of being in the lowest tertile of telomere length. In other words, the more screen based time that was spent, the greater the chance your telomeres were short enough to put you at the bottom of the study group in regards to telomere length. Hence you have a higher risk of an early illness or death! Physical activity is associated with greater telomere length up to a certain point. The core findings of people with LTL values that were in the bottom group (short telomeres) was that they were more sedentary, engaged in little moderate to vigorous physical activity, had high CRP levels (inflammation marker), had a higher BMI (fatter), and more likely to have diabetes, hypertension, and coronary artery disease. The chance of a person falling into this category, again increased by 7% for each hour of screen based leisure time that they spent. Leukocyte telomere shortening is a marker of cellular aging and also is associated with increased morbidity (high blood pressure/diabetes) and mortality. When LTL become critically shortened, the leukocytes secrete pro-inflammatory cytokines and hence increase the CRP ( a marker of inflammation). Thus being sedentary results in inflammation and modulates your metabolic risk in the wrong direction. In other words, you age faster!!! The key point: Stay active physically and spend less time on Facebook!! Suppression of skeletal muscle lipoprotein lipase activity during physical inactivity: a molecular reason to maintain daily low-intensity activity Bottom line of article: Inactivity caused a local reduction of plasma [3H]triglyceride uptake into muscle and a decrease in high density lipoprotein cholesterol concentration. Treadmill walking raised LPL activity approximately 8-fold (P < 0.01) within 4 h after inactivity The striking sensitivity of muscle LPL to inactivity and low-intensity contractile activity may provide one piece of the puzzle for why inactivity is a risk factor for metabolic diseases and why even non-vigorous activity provides marked protection against disorders involving poor lipid metabolism. The benefits of regular physical activity have been known since ancient Greek. But in the last Century the scientific knowledge around this topic has progressed enormously, starting with the early studies of JN Morris and RS Paffenberger, who demonstrated that physical activity at work reduced incidence of cardiovascular disease and mortality. In the Harvard alumni study, the lowest risk was associated with a weekly output of 1000 to 2000 kcal performing vigorous activities. Further studies in all age groups have supported these findings and have added that even moderate levels of physical activity provide considerable benefits to health, including lower prevalence of overweight and obesity at all ages. Metabolic fat oxidation rate is highest at exercise intensities between 45 and 65% of VO2max. This means that people must be active regularly and force physiological mechanisms at certain intensities. All this body of evidence has contributed to current WHO physical activity recommendations of 150 min/week of moderate to vigorous physical activity (MVPA) in adults and elderly, and 60 min/day of MVPA in children and adolescents, with additional strength training, apart from adopting an active lifestyle. In the last 50 years, occupational physical activity has been reduced for about 120 kcal/day, and sedentarism has emerged as an additional risk factor to physical inactivity. Even if less than 60 min of TV time in adults have been related to lower average BMI, there is still a need for research to determine the appropriate dose of exercise in combination with sedentary behaviours and other activities in the context of our modern lifestyle in order to prevent obesity at all ages. As public health measures have failed to stop the obesity epidemic in the last 3 decades, there is clearly a need to change the paradigm. The inclusion of sport scientists, physical education teachers and other professionals in the multidisciplinary team which should be responsible for drawing the road map to prevent the increase of the obesity epidemic effectively is a “must” from our point of view. PHYSICAL INACTIVITY INDUCES INSULIN RESISTANCE. PHYSICAL INACTIVITY DECREASES FAT OXIDATION. PHYSICAL INACTIVITY AFFECTS LIPID TRAFFICKING BETWEEN ADIPOSE TISSUE AND MUSCLE. PHYSICAL INACTIVITY INDUCES ECTOPIC FAT STORAGE. OVERALL, THE PHYSICAL ACTIVITY LEVEL PREDICTS METABOLIC FLEXIBILITY. The following sequence of events can be hypothesized to explain the physical inactivity-induced metabolic alterations and thus metabolic inflexibility (Fig. 4). 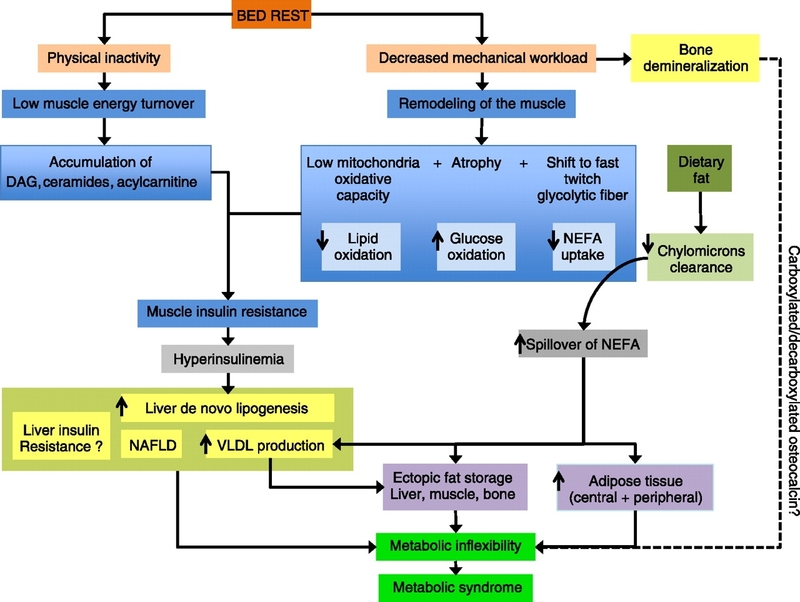 The physical inactivity induced by bed rest leads to insulin resistance in skeletal muscle, requiring a hyperinsulinemic response to properly dispose of glucose in daily postprandial conditions, whereas adipose tissue displays an appropriate response. At the same time, muscle fiber type shifts toward fast-twitch glycolytic fibers, and muscle increases glucose uptake and oxidation through insulin-independent pathways. This in turn inhibits fatty acid oxidation and ultimately uptake. During meal ingestion, hyperlipemia occurs due to a decreased plasma clearance of dietary fat. This increases the flux of dietary lipids to organs and results in ectopic fat storage with consequences on insulin sensitivity. The liver displays susceptibility to hyperinsulinemia and increased lipid synthesis and storage that overcomes rate of oxidations. Hepatic steatosis will likely ensue. With a reduced oxidative capacity, the liver will then contribute to an increased rate of atherogenic lipid products (VLDL) in which the contributions of FFA coming from the diet and neolipogenesis to the total VLDL-triglycerides will increase, feed-forwarding hyperlipemia and ectopic fat storage. Concomitantly, the steatotic liver will become insulin resistant and unable to suppress hepatic glucose production, which leads to increased gluconeogenesis and feed-forward worsening of hyperinsulinemia. 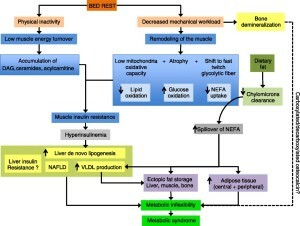 Hypothetical metabolic alterations cascade induced by bed rest that can explain how physical inactivity induces metabolic inflexibility. VLDL, very-low-density lipoprotein; NAFLD, nonalcoholic fatty liver disease; DAG, diacylglycerol. Physical activity predicts metabolic flexibility. For an equivalent food quotient, metabolically flexible subjects will greatly increase carbohydrate oxidation after the consumption of a meal despite a low increase in plasma insulin concentration. A metabolically inflexible individual, i.e., a person who also displays an insulin resistance, will display a low increase in carbohydrate oxidation despite an marked elevation in insulin secretion. Short Telomere Length, Myocardial Infarction, Ischemic Heart Disease, and Early Death -> Findings: Short telomere length is associated with only modestly increased risk of myocardial infarction, ischemic heart disease, and early death. Leucocyte telomere length and risk of cardiovascular disease: systematic review and meta-analysis BMJ 2014;349:g4227 Available observational data show an inverse association between leucocyte telomere length and risk of coronary heart disease independent of conventional vascular risk factors. The association with cerebrovascular disease is less certain. Chronic inflammation induces telomere dysfunction and accelerates ageing in mice Our results show that chronic inflammation aggravates telomere dysfunction and cell senescence, decreases regenerative potential in multiple tissues and accelerates ageing of mice. Anti-inflammatory or antioxidant treatment, specifically COX-2 inhibition, rescued telomere dysfunction, cell senescence and tissue regenerative potential, indicating that chronic inflammation may accelerate ageing at least partially in a cell-autonomous manner via COX-2-dependent hyper-production of ROS.